Hey please don't think it the other way, I don't drink. 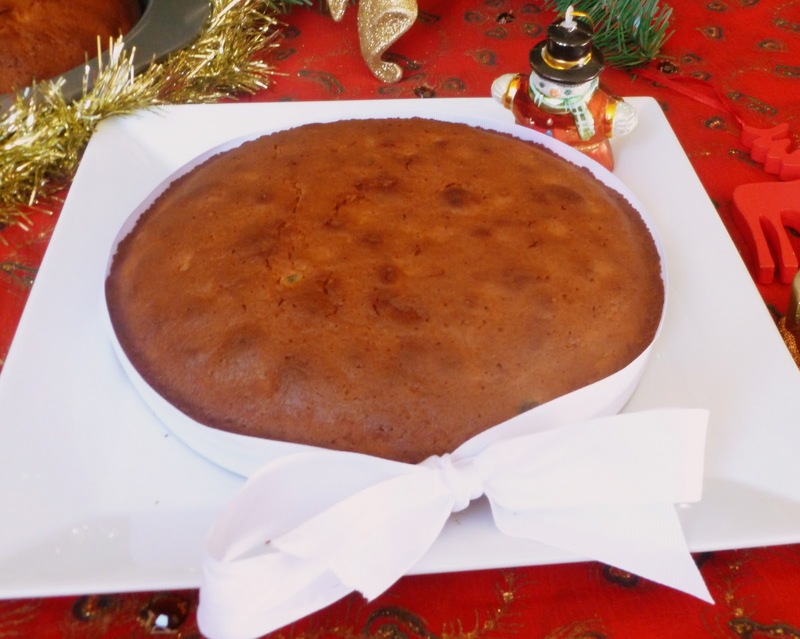 I wanted to make this Christmas cake by soaking dry fruits in Brandy/Rum/Wine - the traditional way and I have been pleading my hubby to get some from almost two weeks. I do drive and get grocery's but I felt awkward to step into a liquor store even though no body around here 'really care' about it. It is 'Happy Holidays' every where around but my hubby had been very busy with his work. Thankfully he got me some Rum a day before Christmas and I made this Cake on Christmas morning by soaking dry fruits for around 12-16 hours. 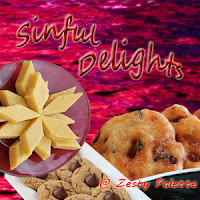 You may avoid soaking them in liquor to make it liquor free, the taste may vary though but I assure you - the cake will not go wrong. I had made the same cake - liquor free version for last Christmas season and it had come out good too. 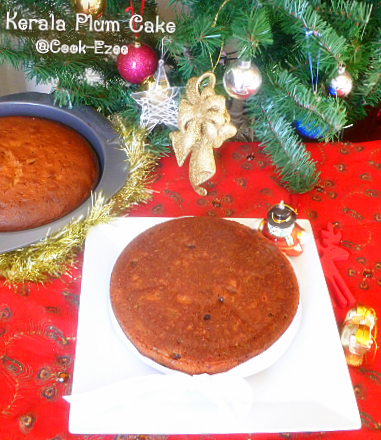 This Christmas I made this fruit cake the traditional way, you can soak the fruits for couple of days more. For me I don't need any particular season to bake it, we enjoy them any time as teatime snack as well but of Course 'Christmas' time is the best to bake them as well. A hot cup of masala Chai and a piece or two(many times it won't stop in 2 pieces ha ha) of this plum cake is perfect for my hubby. I have already got the order to bake some more from him as he says 'Christmas time you should have baked at-least 4' as I baked 2 of them and took one for the X'mas party at our friend's place. 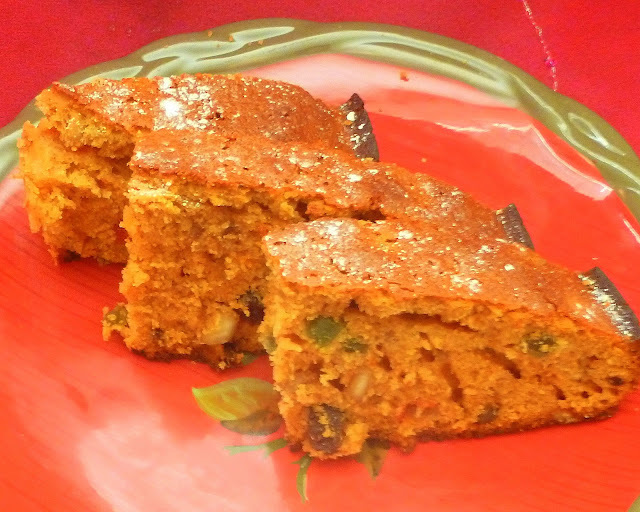 So Enjoy baking 'Kerala Plum Cake/Christmas Fruit Cake'. To make the black caramel - Boil the water and keep. Heat up a thick bottom pan and add 1/4 cup sugar to it. Keep stirring on med-high heat. First they start sticking, then they caramelize to brown sauce and then start getting black. When they turn black add boiling water and stir well and switch off the stove. Stir well till the black caramel mix evenly with water and set aside. Squeeze out orange juice from 2-3 oranges and strain. You need around 1 cup of juice. Set aside. In a large bowl, add the butter and powdered sugar till creamy . Separate the egg yolks and whites. Beat the egg yolks well till they turn lemon yellow and creamy. Add this to the butter-sugar mix and beat well to blend. Add the sifted flour to the above batter little by little and mix well. Beat the egg white till fluffy, do not need to whip the egg whites. Fold in this to the above batter with a spatula or spoon gently. Pour in the caramel, orange juice, vanilla extract, orange peel, pumpkin pie spice, chopped cherries and fold in everything very gently with a spatula. 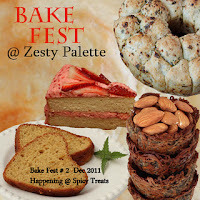 Toss the soaked dry fruits with 3 tbsp all purpose flour so that they do not sink in the bottom of the batter. Add it to the above prepared batter and fold in gently and evenly. Pre-heat the oven to 350 Degree Farenheit. Grease two 8" cake pans with butter or cooking spray. Pour the batter into the pan and pat the pan on the kitchen counter top slightly two three times to remove air bubbles formed if any. Bake it for 45-50 minutes or until a sharp knife or cake tester inserted comes out clean. Enjoy!!! Note: - You can sprinkle little bit of powdered sugar before you serve if desired only. Adjust the sweetness according to the sweetness you need. 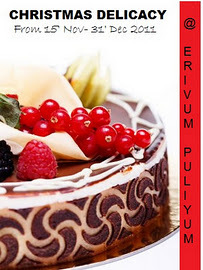 Sending this Christmas Delicacy Event hosted by Julie @ Erivum Puliyum. Loved this beautiful christmas cake dear...lovely color n delicious!! Cake looks awesome and lovely presentation. Thx for stopping by and introducing me to your lovely blog. Super tempting cake,looks so nice. yummilicious n perfect dear..plum cake looks good..we all prefer this to icing cakes! same pinch..i too posted a plum cake recipe today :)cake looks yumm..
Wishing you a happy newyear dear..
cake looks awesome, so perfect and delicious..
cake looks fabulous... perfect and delicious..